Huawei launches its Honor 8X Smartphone in India this week. The new Honor 8X will be competing with the already existing Redmi Note 5 Pro and Realm 2 Pro Devices in the market. Let's know what is the difference between these 3 smartphones, specificati-ons, price and features. Talking about photography, 3 smartphones have rear dual cameras. Honor 8X has 20 megapixel primary and 2 Mp depth sensor. Realme 2 Pro is equipped with 16 megapixel primary and 2 Mp depth sensor. Redmi Note 5 Pro comes with 15 megapixel primary and 5 Mp secondary depth sensor. Talk about Selfie, the Honor 8X and Realme 2 Pro have a 16 Mp front camera. Redmi Note 5 Pro has a 20 Mp front sensor. The 3 smartphones get Support of Face Unlock feature. Honor 8X has a glass backside design and dual tone finish which gives it a premium look. The realme 2 Pro comes with a polymer glass back and is made of plastic and equipped with glossy finish. The Redmi Note 5 Pro comes with metal rear. The Redmi Note 5 Pro has a 5.99 inch Full HD + 18: 9 display and is a no-noch phone. The screen's resolution is 1080x2160 pixels and the screen's density is 403pp. There is noch display in Honor 8X and Realme 2 Pro. Realme 2 Pro has a 6.3 inch Full HD + display, Honor 8X 6.5 inch FullHD + panel. Both have a resolution of (1080x2340) pixels and the screen to body aspect ratio is 19.5 : 9. In Honor 8X, the smartphone comes with 64GB / 128GB inbuilt storage variant with 4 GB RAM / 6GB RAM. Redmi Note 5 Pro offers the option of 64GB with 4 GB of RAM and 6 GB RAM. Realme2 Pro offers 4 GB RAM / 6GB / 8GB RAM while 64 GB / 128GB inbuilt storage is available for storage. Talking about the software, Honor 8X Android 8.1 runs on oreo-based EMUI 8.1. The Redmi Note comes with ss5 Pro android Noga based Miui Skin. Realme 2 Pro runs on Android 8.1 oreo based Color OS. In Honor 8X, the Kirin 710 octa-core processor has been given. The Redmi Note 5 Pro Snapdragon 636 processor has the option of snapdragon 660 processors in Realme 2 Pro. Honor 8x 4 GB RAM and 64 GB storage variant is Priced at 14,999 Rs (205.08 United States Dollar). 6 GB RAM and 64GB storage variant priced Rs 16,999 (232.43 United States Dollar) while 6 GB of RAM and 128 GB storage variant is priced at Rs 18,999 (259.77 United States Dollar).The sale of the smartphone will be exclusively on Amazon India from October 24. Redmi Note 5 Pro 4 GB RAM variant costs Rs 14,999 (205.08 United States Dollar) while the 6 GB RAM variant is priced at Rs 16,999 (205.08 United States Dollar). The phone is found on MIDCOM and Flipkart. 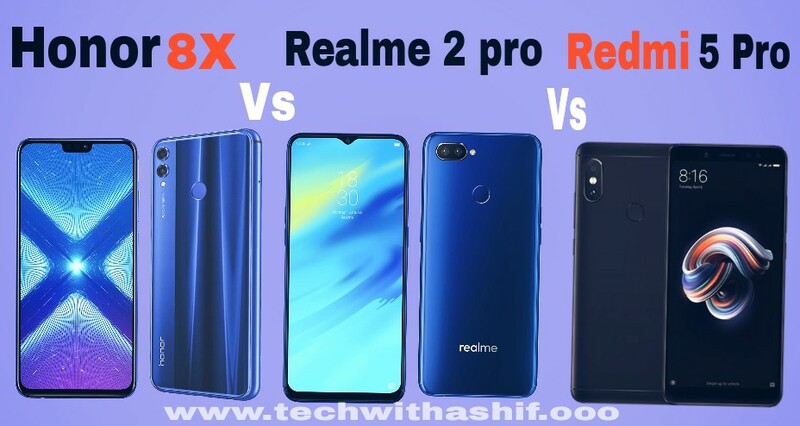 The price of 4 GB RAM variant of Realme 2 Pro will be 13,990 rupees (191.29 United States Dollar). 6GB RAM variant costs Rs 15,990 (218.63 United States Dollar) and 8GB RAM variant of Rs 17,990 (245.98 United States Dollar). The phone is found on Flipkart. 3750MAh battery is given in Huawei Honor 8X & Realme 2 Pro has 3500MAh battery. To give a power to the xiaomi Redmi Note 5 Pro, the maximum capacity is 4000MAh. For connectivity, there are three smartphones, GPS, Wi-Fi,Bluetooth, Dual SIM card slot and 4G VOLTE options.Please share in the comments about what to think about these phones.